This is an exciting julep. Zacapa is full bodied with almond flavors that once are opened are covered with honey and toffee. The second layer to this julep is filled with dried fruit and a pinch of spice that is illuminated by the subtle lemon grass found in Bols Genever and fresh mint. Blackberries add a layer of berry sweetness without being overbearing bringing forward the dried fruit notes. With it’s complex flavors and many layers this julep will leave you making another before you have finished your first. 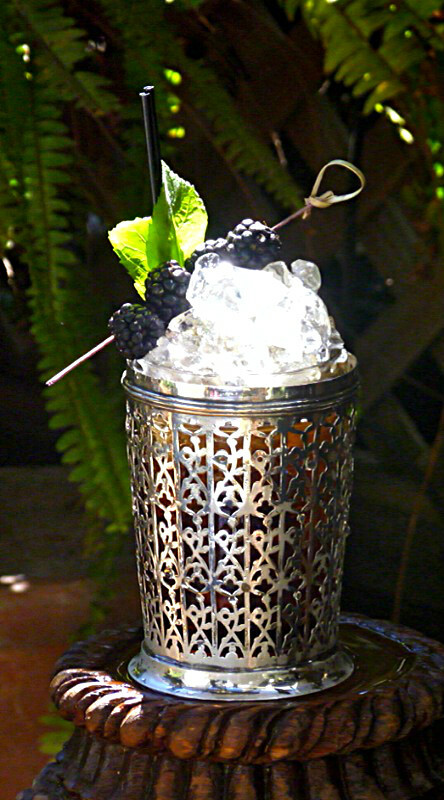 Muddle mint, blackberries and dermerana syrup in the bottom of a Julep cup or rocks glass. Add Zacapa and Bols Genever. Stir 30 times. Top with crushed ice. Stir again until frost appears on the outside of the glass. Top with crushed ice and garnish with blackberries and a spring of fresh mint.